Houston Kidney Associates | Wasae Tabibi, M.D. Dr. Wasae Tabibi is a board certified practicing nephrologist in Houston. He joined Drs. Fadem , Buquing and Robeson in 1997 and became charter member of Kidney Associates, PLLC. 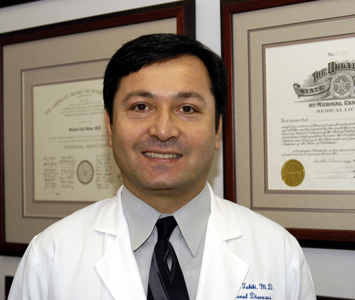 Dr. Tabibi graduated from The University Of Texas Medical School in Houston in 1991 and completed his residency training in internal medicine at The University Of Texas Affiliated Hospitals in Houston in 1994. He then completed his subspecialty training in kidney diseases and hypertension at the Renal Division Of The University Of Texas Medical School in Houston in 1996. He practices general nephrology and is also active in clinical research at Kidney Associates. He is married and has three children.